1. 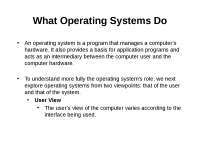 What is an operating system? An operating system acts as an intermediary between the user of a computer and the computer hardware. 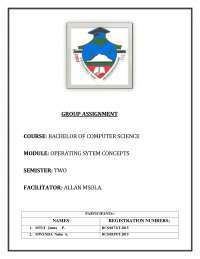 The purpose of an operating system is to provide an environment in which a user can execute programs in a convenient and efficient manner. An operating system is software that manages the computer hardware. The hardware must provide appropriate mechanisms to ensure the correct operation of the computer system and to prevent user programs from interfering with the proper operation of the system. 2. Define Bootstrap program. For a computer to start running:—for instance, when it is powered up -or rebooted —it needs to have an initial program to run. 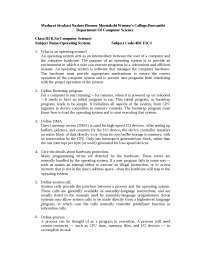 This initial program, or bootstrap program, tends to be simple. It initializes all aspects of the system, from CPU registers to device controllers to memory contents. The bootstrap program must know how to load the operating system and to start executing that system. 3. Define DMA. Direct memory access (DMA) is used for high-speed I/O devices. After setting up buffers, pointers, and counters for the I/O device, the device controller transfers an entire block of data directly to or -from its own buffer storage to memory, with no intervention by the CPU. Only one interrupt is generated per block, rather than the one interrupt per byte (or word) generated for low-speed devices. 5. Define system call. 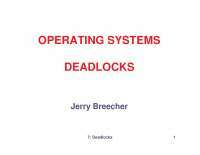 System calls provide the interface between a process and the operating system. These calls are generally available as assembly-language instructions, and are usually listed in the manuals used by assembly-language programmers. Some systems may allow system calls to be made directly from a higherlevel language program, in which case the calls normally resemble predefined function or subroutine calls. 7. Draw the diagram of process state. 9. Define device queue. When a process is allocated the CPU, it executes for awhile and eventually quits, is interrupted, or waits for the occurrence of a particular event, such as the completion of an I/O request. In the case of an I/O request, such a request may be to a dedicated tape drive, or to a shared device, such as a disk. Since there are many processes in the system,the disk may be busy with the I/O request of some other process.the process therefore may have to wait for the disk. The list of processes waiting for a particular I/O device is called a device queue. 10. Define scheduler. A process migrates between the various scheduling queues throughout its lifetime. The .operating system must select, for scheduling purposes, processes from these queues in some fashion. The selection process is carried out by the appropriate scheduler. instance, some processors (such as the DECSYSTEM-20) provide multiple sets of registers., A context switch simply includes changing the pointer to the current register set. 14. Define throughput and turnaround time. Throughput:If the CPU is busy executing processes, then work is being done. One measure of work is the number of processes that are completed per time unit, called throughput Turnaround time:The interval from the time of submission of a process to the time of completion is. the turnaround time. Turnaround time is the sum of the periods spent waiting to get into memory, waiting in the ready queue, executing on the CPU, and doing I/O. 16. 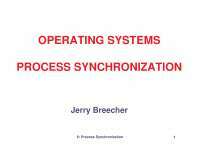 What is the purpose of multiple processor scheduling? If several identical processors are available, then load sharing can occur. It would be possible to provide a separate queue for each processor. In this case, however, one processor could be idle, with an empty queue, while another processor was very busy. To prevent this situation, we use a common ready queue. All processes go into one queue and are scheduled onto any available processor. one job with the computation of other jobs. Even in a simple system, the spooler may be reading the input of one job while printing the output of a different job. 18. 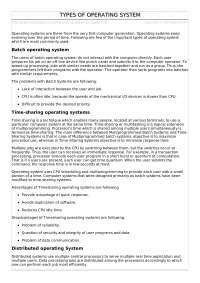 Define Time sharing system. Time sharing, or multitasking, is a logical extension of multiprogramming. Multiple jobs are executed by the CPU switching between them, but the switches occur so frequently that the users may interact with each program while it is running. An interactive, or hands-on, computer system provides on-line communication between the user and the system. 19. What is the difference between real time scheduling and thread scheduling? A real-time scheduling System is composed of the scheduler, clock and the processing hardware elements. In a real-time system, a process or task has schedulability; tasks are accepted by a real-time system and completed as specified by the task deadline depending on the characteristic of the scheduling algorithm. A thread is a path of execution within a process. Also, a process can contain multiple threads.Thread is also known as lightweight process. The idea is achieve parallelism by dividing a process into multiple threads. For example, in a browser, multiple tabs can be different threads. MS word uses multiple threads, one thread to format the text, other thread to process inputs etc. 20. Define caching? Caching is an important principle of computer systems. Information is normally kept in some storage system (such as main memory). As it is used, it is copied into a faster storage system—the cache—on a temporary basis. When we need a particular piece of information, we first check whether it is in the cache. If it is, we use the information directly from the cache; if it is not, we use the information from the main storage system, putting a copy in the cache under the assumption that there is a high probability that it will be needed again.